Tottenham Hotspur defeated Borussia Dortmund, 3-0, in the first leg of their UEFA Champions League Round of 16 match on Wednesday at Wembley Stadium in London. Dortmund midfielder Christian Pulisic fights for the ball with Tottenham defender Juan Foyth, left, during the Champions League round of 16, first leg, soccer match between Tottenham Hotspur and Borussia Dortmund at Wembley stadium in London, Wednesday, Feb. 13, 2019. Tottenham defender Toby Alderweireld, left, and Dortmund forward Jadon Sancho challenge for the ball during the Champions League round of 16, first leg, soccer match between Tottenham Hotspur and Borussia Dortmund at Wembley stadium in London, England, Wednesday, Feb. 13, 2019. 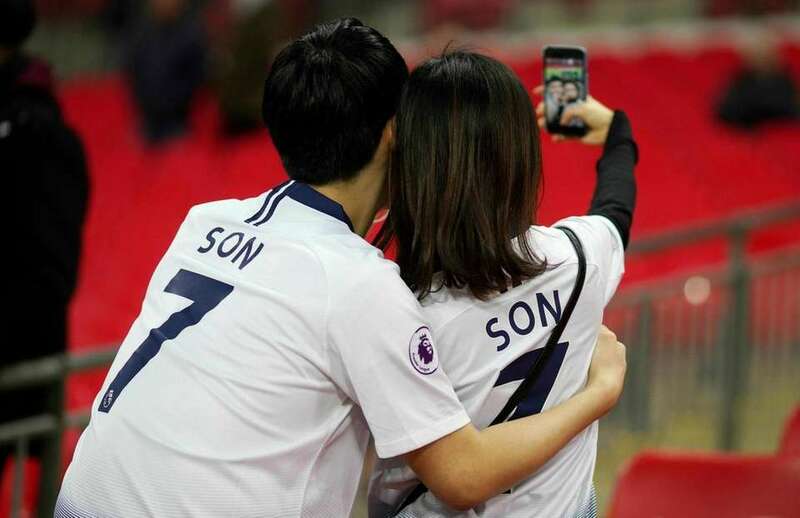 Tottenham Hotspur fans take a selfie before the Champions League round of 16, first leg match between Totten and Borussia Dortmund, at Wembley Stadium in London, Wednesday Feb. 13, 2019. Tottenham Hotspur's South Korean forward Son Heung-min. 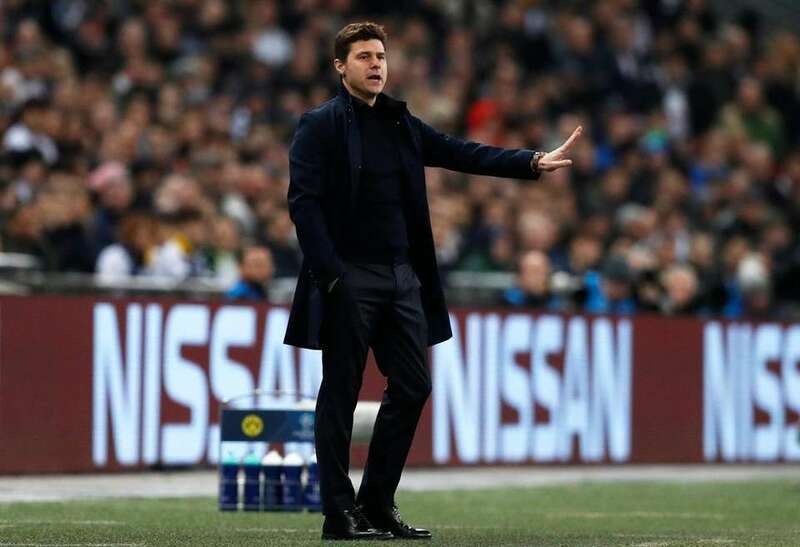 Tottenham coach Mauricio Pochettino gestures during the Champions League round of 16, first leg, soccer match between Tottenham Hotspur and Borussia Dortmund at Wembley stadium in London, Wednesday, Feb. 13, 2019. 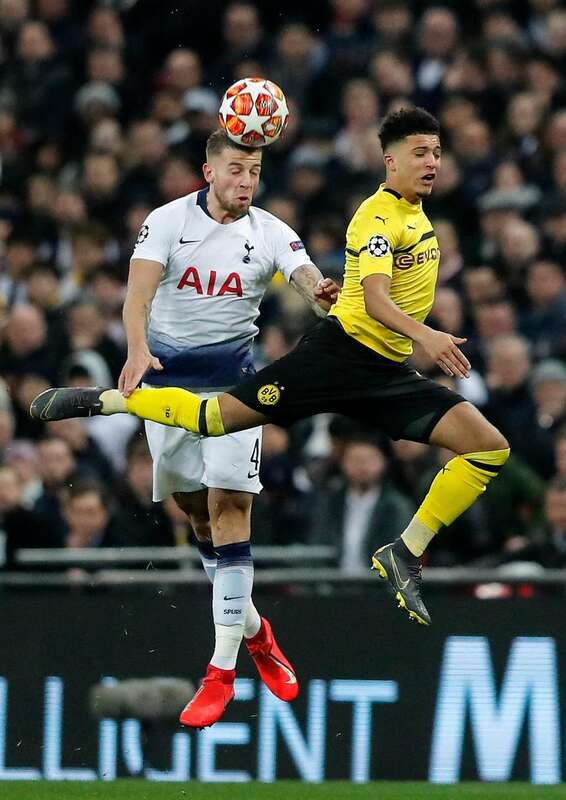 Dortmund forward Jadon Sancho, left, vies for the ball with Tottenham defender Toby Alderweireld during the Champions League round of 16, first leg, soccer match between Tottenham Hotspur and Borussia Dortmund at Wembley stadium in London, Wednesday, Feb. 13, 2019. Tottenham defender Jan Vertonghen, right, and Dortmund forward Jadon Sancho challenge for the ball during the Champions League round of 16, first leg, soccer match between Tottenham Hotspur and Borussia Dortmund at Wembley stadium in London, England, Wednesday, Feb. 13, 2019. 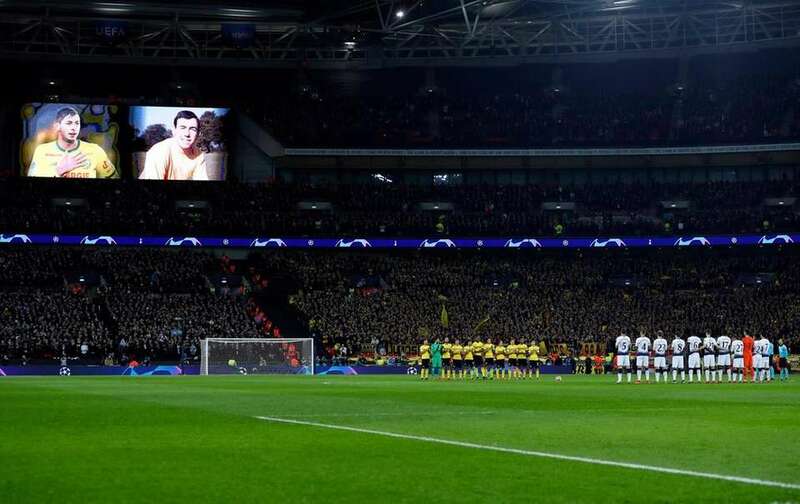 Dortmund, left, and Tottenham players stand during a minute of silence in memory of former players Emiliano Sala and England goalkeeper Gordon Banks who died recently, before the Champions League round of 16, first leg, soccer match between Tottenham Hotspur and Borussia Dortmund at Wembley stadium in London, Wednesday, Feb. 13, 2019. 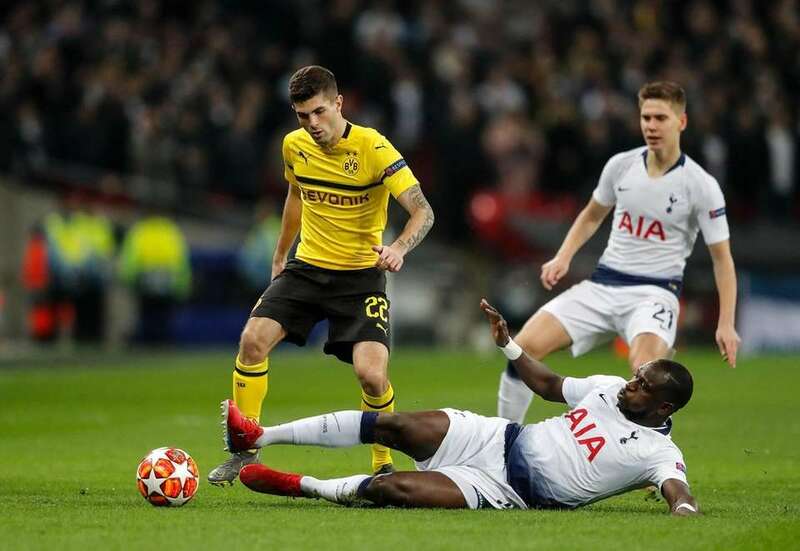 Tottenham midfielder Moussa Sissoko, down, and Dortmund midfielder Christian Pulisic, left, challenge for the ball during the Champions League round of 16, first leg, soccer match between Tottenham Hotspur and Borussia Dortmund at Wembley stadium in London, England, Wednesday, Feb. 13, 2019. 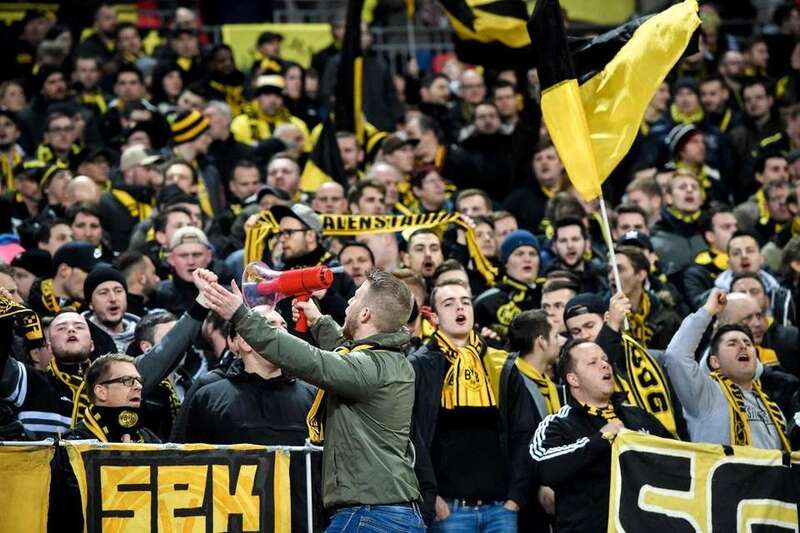 Dortmund supporters cheer prior to the UEFA Champions League round of 16 soccer match between Tottenham Hotspur and Borussia Dortmund at Wembley Stadium, Britain, 13 February 2019. 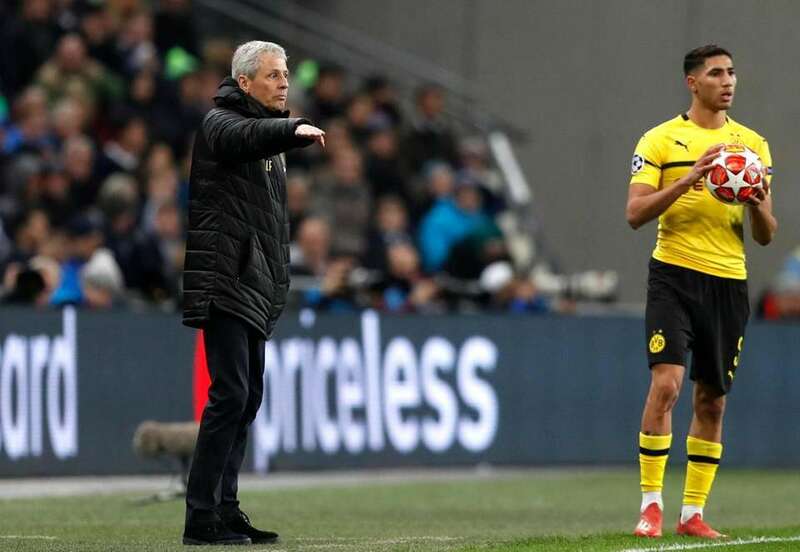 Dortmund coach Lucien Favre gestures as Dortmund defender Achraf Hakimi gets ready to throw the ball during the Champions League round of 16, first leg, soccer match between Tottenham Hotspur and Borussia Dortmund at Wembley stadium in London, Wednesday, Feb. 13, 2019. 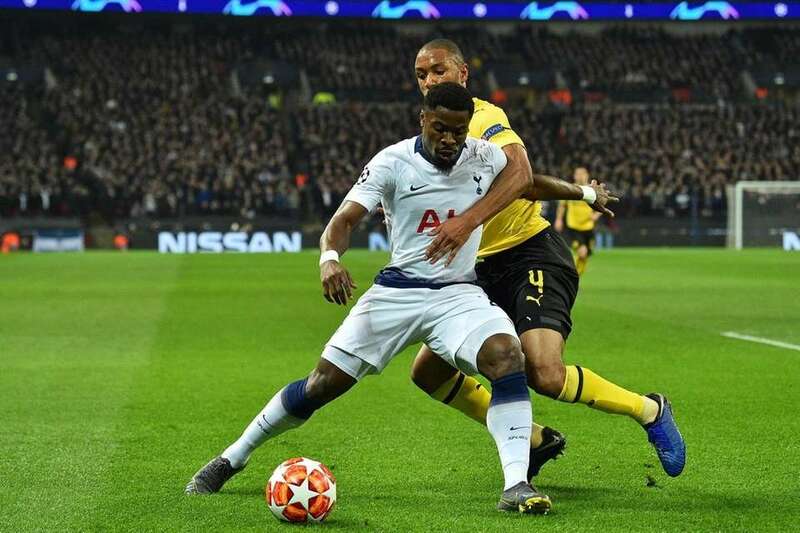 Tottenham Hotspur's Ivorian defender Serge Aurier (L) vies with Dortmund's French defender Abdou Diallo (R) during the UEFA Champions League round of 16 first leg football match between Tottenham Hotspur and Borussia Dortmund at Wembley Stadium in London on February 13, 2019. Dortmund's US midfielder Christian Pulisic (R) runs past Tottenham Hotspur's Argentinian defender Juan Foyth (L) during the UEFA Champions League round of 16 first leg football match between Tottenham Hotspur and Borussia Dortmund at Wembley Stadium in London on February 13, 2019. 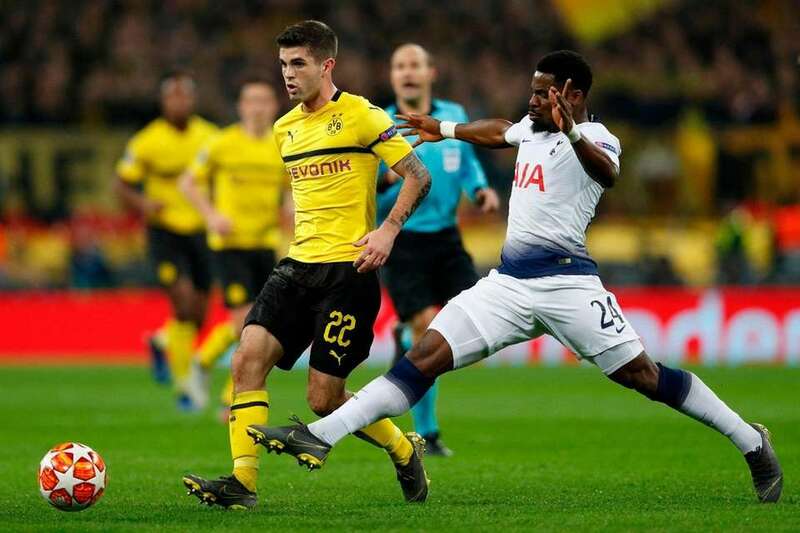 Dortmund's US midfielder Christian Pulisic (L) vies with Tottenham Hotspur's Ivorian defender Serge Aurier (R) during the UEFA Champions League round of 16 first leg football match between Tottenham Hotspur and Borussia Dortmund at Wembley Stadium in London on February 13, 2019. Dortmund's Jadon Sancho in action during the UEFA Champions League round of 16 soccer match between Tottenham Hotspur and Borussia Dortmund at Wembley Stadium, Britain, 13 February 2019. 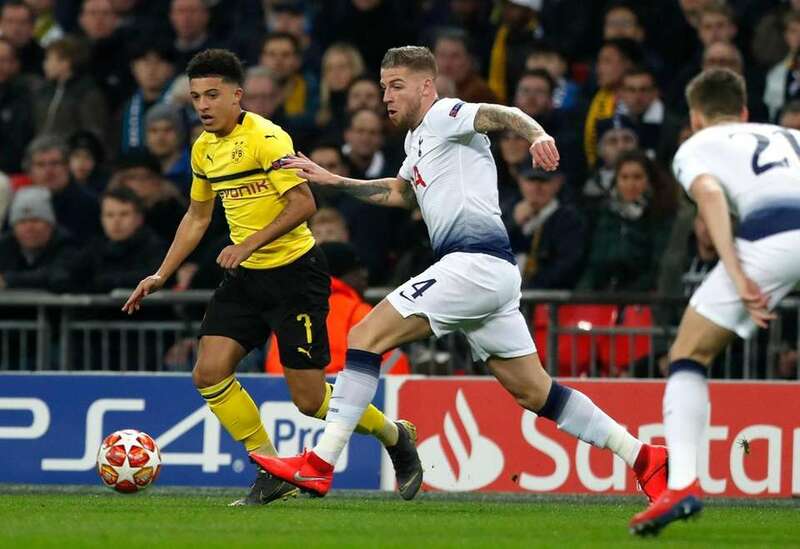 Tottenham's Toby Alderweireld (L) in action against Dortmund's Jadon Sancho (R) during the UEFA Champions League round of 16 soccer match between Tottenham Hotspur and Borussia Dortmund at Wembley Stadium, Britain, 13 February 2019. 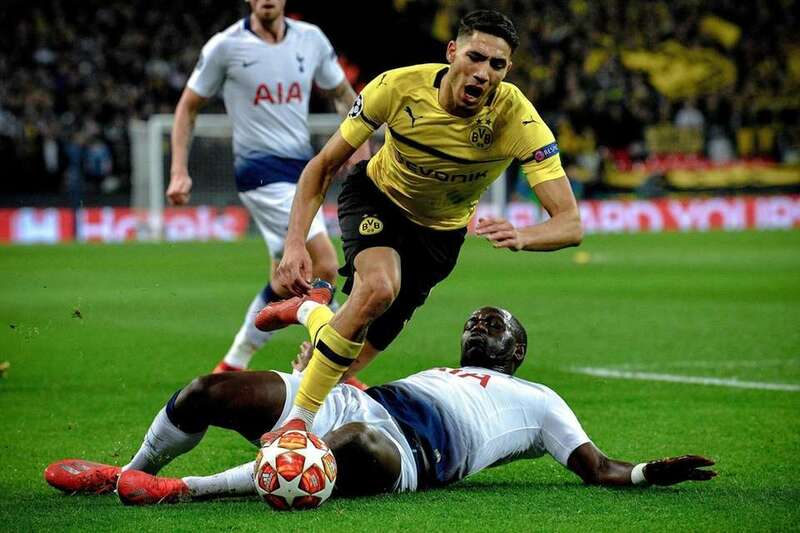 Tottenham's Serge Aurier (buttom) in action against Dortmund's Achraf Hakimi (top) during the UEFA Champions League round of 16 soccer match between Tottenham Hotspur and Borussia Dortmund at Wembley Stadium, Britain, 13 February 2019. Tottenham's Serge Aurier (rear) in action against Dortmund's Achraf Hakimi (front) during the UEFA Champions League round of 16 soccer match between Tottenham Hotspur and Borussia Dortmund at Wembley Stadium, Britain, 13 February 2019. 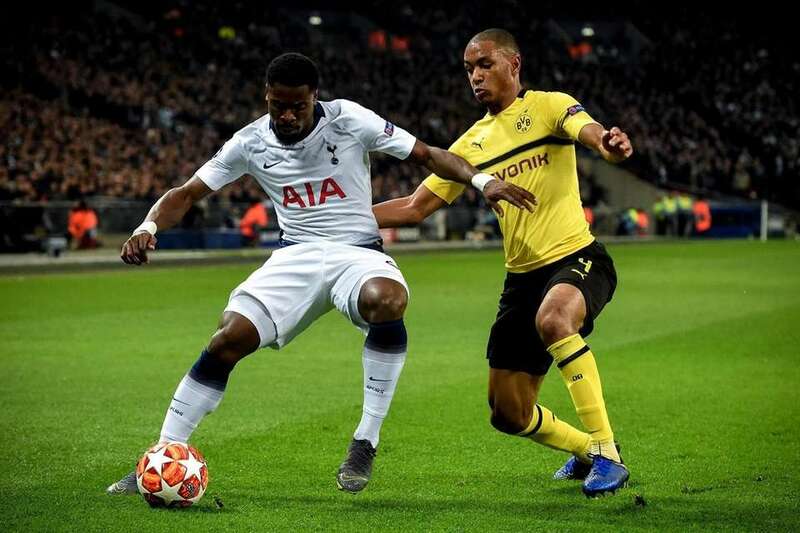 Tottenham's Serge Aurier (L) in action against Dortmund's Abdou Diallo (R) during the UEFA Champions League round of 16 soccer match between Tottenham Hotspur and Borussia Dortmund at Wembley Stadium, Britain, 13 February 2019. 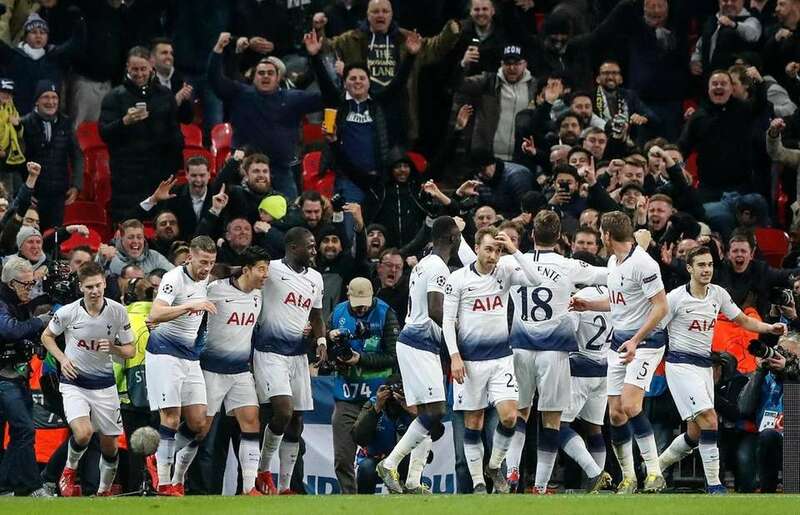 Tottenham celebrates after scoring their third goal during the Champions League round of 16, first leg, soccer match between Tottenham Hotspur and Borussia Dortmund at Wembley stadium in London, England, Wednesday, Feb. 13, 2019. Dortmund's German midfielder Mahmoud Dahoud (C) controls the ball during the UEFA Champions League round of 16 first leg football match between Tottenham Hotspur and Borussia Dortmund at Wembley Stadium in London on February 13, 2019. 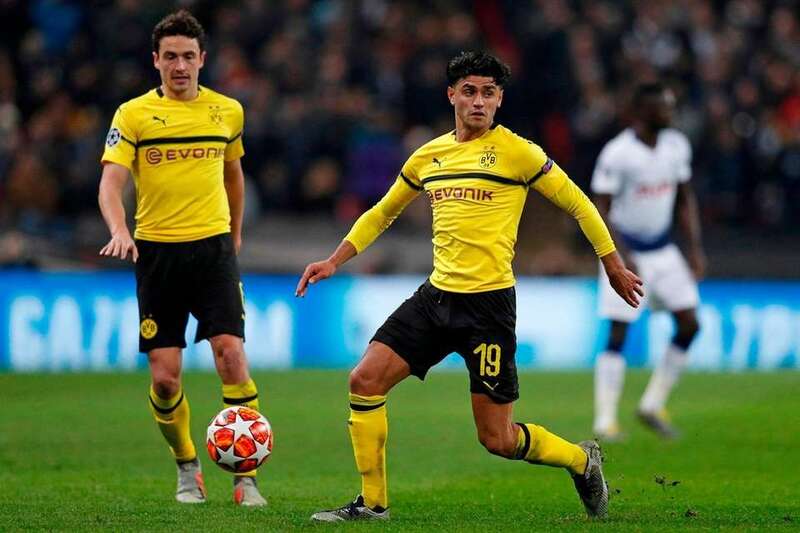 Dortmund's German midfielder Mahmoud Dahoud (L) and Tottenham Hotspur's English midfielder Harry Winks (2nd L) compete for the ball in the Dortmund area during the UEFA Champions League round of 16 first leg football match between Tottenham Hotspur and Borussia Dortmund at Wembley Stadium in London on February 13, 2019. Tottenham Hotspur's Belgian defender Jan Vertonghen (L) celebrates with Tottenham Hotspur's South Korean striker Son Heung-Min (R) after scoring their second goal during the UEFA Champions League round of 16 first leg football match between Tottenham Hotspur and Borussia Dortmund at Wembley Stadium in London on February 13, 2019. Tottenham forward Fernando Llorente celebrates after scoring his side's third goal during the Champions League round of 16, first leg, soccer match between Tottenham Hotspur and Borussia Dortmund at Wembley stadium in London, Wednesday, Feb. 13, 2019. Tottenham's Heung-min Son celebrates after scoring the 1-0 lead during the UEFA Champions League round of 16 soccer match between Tottenham Hotspur and Borussia Dortmund at Wembley Stadium, Britain, 13 February 2019. 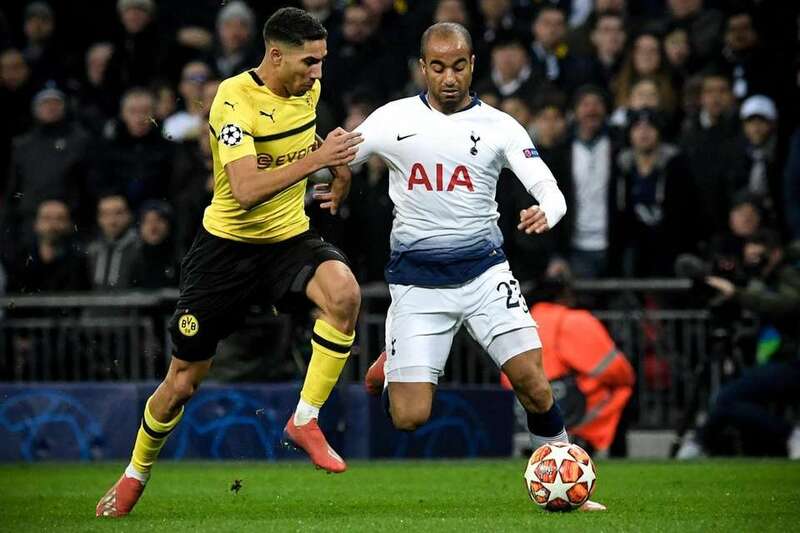 Dortmund's Achraf Hakimi (L) in action against Tottenham's Lucas (R) during the UEFA Champions League round of 16 soccer match between Tottenham Hotspur and Borussia Dortmund at Wembley Stadium, Britain, 13 February 2019. 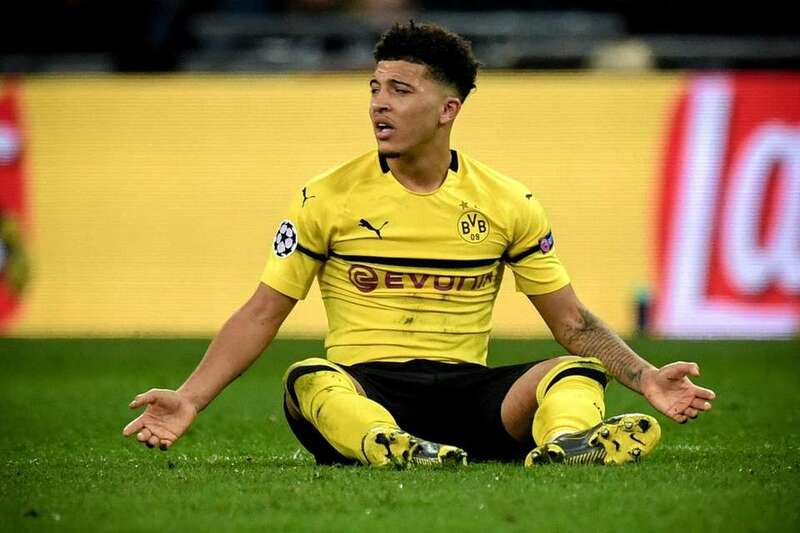 Dortmund's Jadon Sancho reacts during the UEFA Champions League round of 16 soccer match between Tottenham Hotspur and Borussia Dortmund at Wembley Stadium, Britain, 13 February 2019. 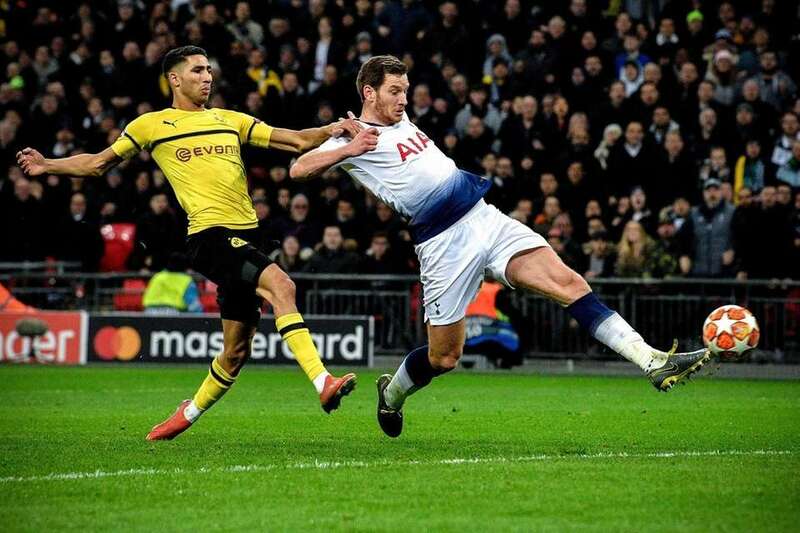 Tottenham's Jan Vertonghen (R) in action against Dortmund's Achraf Hakimi (L) as he scores the 2-0 lead during the UEFA Champions League round of 16 soccer match between Tottenham Hotspur and Borussia Dortmund at Wembley Stadium, Britain, 13 February 2019. 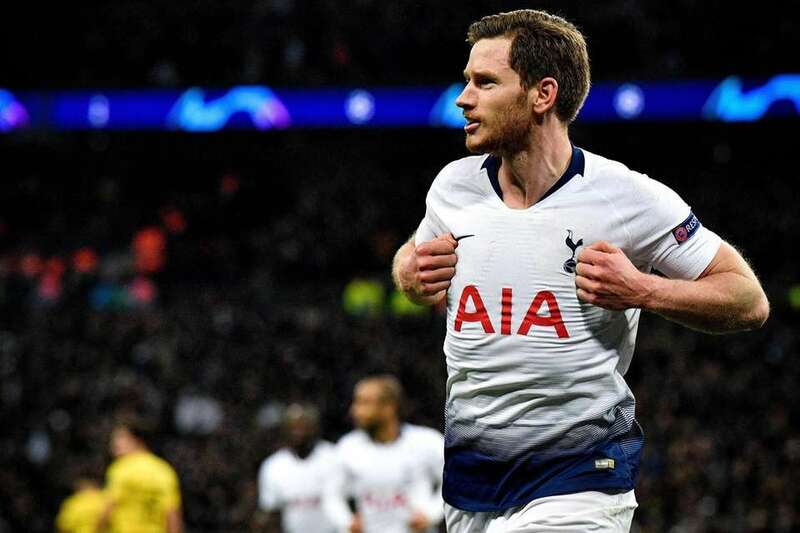 Tottenham's Jan Vertonghen celebrates after scoring the 2-0 lead during the UEFA Champions League round of 16 soccer match between Tottenham Hotspur and Borussia Dortmund at Wembley Stadium, Britain, 13 February 2019.